San Luis Obispo is a really neat town. Small (except for all those Cal-Poly students). Charming. Friendly. I mean seriously friendly. I watched what was nearly a disaster after lunch today. A driver started to make a right turn on red without looking and came within about a hair’s breadth of taking out a pedestrian. He actually did make contact with her, just not enough to knock her down. And she smiled and waved him on. Now come on. Consider where I live. Can you imagine someone in the Greater New York Metropolitan Statistical Area (or whatever it’s called these days) smiling and waving at a driver who did that? Oh, the pedestrian would be waving at the driver, all right, but only with one particular digit… and not with a smile. So it has to be something about California. A place where I lived, briefly, as a child. And where I have both the best and worst of memories. You see, there was something about California that turned my mother into a complete lunatic for a period when I was in second grade. She was fine when we were in New Jersey both before and after our six months in San Rafael, a lovely town across the Golden Gate Bridge from San Francisco. No, it was only in California that she decided, for heaven only knows what reason, that it was time my sister Diana and I learned to eat… liver. I was six years old that year when my father accepted a temporary assignment in California, but I remember so much about it. I remember being taken out into the backyard to watch that newfangled miracle of miracles — a satellite passing overhead in the night sky. And I remember the liver. Now as far as I’m concerned there is absolutely no redeeming social value to liver. I am informed by my oldest brother that having one inside my body is good for me, and I’m willing to believe him: he’s got a medical degree and I don’t. But on my plate? No. Nope nope nope won’t do it can’t make me. And that, as I recall, is basically what both Diana and I told our mother when she decided we had to eat the liver. First she tried bribery. If we would eat the liver, we could go for a ride on the San Francisco cable cars. Hey, I’m six years old. I’ve lived six whole years without cable cars. I figure I’m good for at least another six without cable cars. I’m not taking bets on living til morning if I eat the liver. Next she tried disguise. Yeah, sure. Considering the… um… how to put this delicately… stench that cooking liver makes, disguising it is not really going to work very well with a pair of grammar schoolers. And then she put her foot down. We would get nothing to eat, she decreed, until we ate the liver. We held out for three days. What’s that? The best memory? Oh, yeah. That. Well, some 20 or so years after we left California, I returned for a visit. I went to San Francisco. I rode the cable cars. Now I know San Francisco. I know its diversity and its tolerance of the eccentric. Nope nope nope won’t do it can’t make me. Image: Wikimedia Commons, user Steve Walling. I’m with you. I cannot stand liver. This is a rather common food on people’s hate lists, and I wonder if there’s a genetic component. I happen to be homozygous for a hemochromatosis mutation (iron overload disease), probably a coincidence, but the thought popped into my head that hating liver might be a way of reducing dietary iron. I proposed “Do you hate liver?” as a quick survey question at 23andMe. The survey system might not be able to handle all the no answers! Good point! – I plead forgiveness, due to laughing too hard almost to type, let alone think clearly! I’m delighted to report that organ meats are now disapproved by the medical establishment. Heh heh. Coffee, chocolate and red wine, good. Liver bad. Love it. Oh how I wish that I could write like you. Loved your post. I love liver and SF cable cars. No, my bottom line was meatloaf. I remember sitting at the dining room table for about eight hours, not eating meatloaf. I think the sitting there refusing to eat something is another of those universal memories! I can spot a speck of liver in a highly spiced dish. Nope nope nope won’t do it can’t make me. I have lived in California for 38 years, I had liver once in my life, in a high end restaurant in Philadelphia. I love you blog, this get my vote as one of the best ever. Your mother should have said it was chicken liver!!! I also grew up in a time when, even in France, you ate calf liver as a kid at least once a month. It was cheap and well, good for you, wasn’t it? We happened to liked it! (We had learned of course that, if you said you didn’t like something, you got a little extra to learn how to like it! Our neighbor however hated calf liver. So his mother told him that no more calf liver would enter the house, that from then one it would only be chicken liver. He loved it! And he continued to eat ….calf liver. We knew and never spilled the beans and still laugh about the ruse now. Thanks for the memory. No, my father cooked chicken livers at breakfast and those were — if anything — less appetizing to me. A liver should be inside a body, cleaning it of toxins (think about that function for a minute), or decently buried. I love all liver!! Calf liver, chicken liver, all liver! 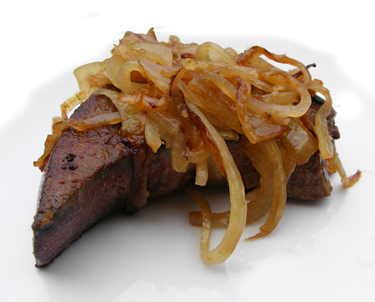 I’m particularly fond of calves’ liver when it has been deveined and then fried with onions. My brother and I make it a point to go to one particular restaurant in our area that does an excellent job of cooking the liver. I laughed out loud about your riding the cable cars, shouting to the world that you hadn’t eaten your liver! For me–it would have been cooked spinach. I sat at our big oak kitchen table long after everyone else had finished their meal, trying to eat that gosh awful spinach. As last resort, I’d hold my nose, gag it down and then drink a glass full of milk or water to wash it down! As an adult, I’ll eat raw spinach in salads, spinach lasagna, but never just plain cooked spinach. Thanks so much for your blog. I enjoy it immensely and learn from it constantly. Thanks for the kind words, Shirley, and — wouldn’t you know it — I love spinach! The only reasonable culinary use of liver is to make chopped liver! (And mine is awesome.) But my mother also tried to make my brother and me eat fried liver with onions when we were kids. She always cooked it to death — shoe leather. We would sit for hours after dinner making designs on the plate with the ketchup we had poured on it to try to make it edible. We got the threat, “If you don’t eat it now you’ll get it for breakfast.” Eventually my mother realized we just flat-out didn’t like liver and gave up. Why mothers insist on trying to make kids eat that stuff is beyond me. My mother’s version of you must eat your liver was a bit different. She froze it and then put it through one of those clamp-to-the-counter meat grinders to make it into tiny pieces which she then mixed into tomato juice and expected me to drink. Needless to say, I don’t much like tomato juice either. Oh yuck! Connie that’s even worse that just dumping it on a plate! YUCK! You’re giving Dickens a run for his money with your best and worst of times. It is tragic about liver, though. I loathed it as a child and love it just as much as an adult. All it took was a couple years in France where people can actually cook. Glad you like it. You can have allllllllll the liver that I might otherwise be expected to eat. Thanks for the memories. This was a good jog to the memories, and I still won’t eat LIVER! Mother made us eat it and I use to cook it once a month until I decided that why put my family through that! What a fun way to bring back those memories. Making kids eat things like that ought to be regarded as child abuse. Maybe it’s something about California? I was born and raised in SoCal. My parents were from Pennsylvania and loved liver and onions and Scrapple, but they were considered acquired tastes and my siblings and I were not required to eat them. Creamed corn? That was a different thing, and I fell asleep at the table refusing to eat it. I eventually got a dispensation for that, too, because it made me gag, but for nothing else. Best post ever, Judy, and that’s saying somethin’! Judy, I understand your thoughts, alas when pregnant with first child major complications came about. Dr insisted I had to eat raw liver to be able to have nutrients in body for fetus to survive. I did not like the smell of Mom’s cooked liver it always made me toss. So talked to an Aunt. She taught me to fix liver without that smell, Yup it can be done and I ate liver and our son is alive today. Ever once in while I think about a good piece of properly fixed liver, but smothered in onions.. It was the iron content they thought we were short due to war time and minimal meat. I asked the Dr why it had to be liver because the smell curled my toes. I loved your post I could actually see you doing this. SF’s Cable cars were fun. I even can tell about when because of Sputnik flying around. HUGS and Love. I’d have much rater gotten the iron in a pill, Suzi!! But I’m glad it did what you needed. And yep… Sputnik it was. Great post. Have to say as a Pennsylvania native, I love liver! Any kind. And, smothered in onions and bacon is . . . well, delish! But I also like spinach, scrapple (you don’t want to know how it’s made), and creamed corn. Now if you are talking about oysters, clams and mussles. . . that’s a whole different story. LOL! You can have the liver, I’ll take the mussels and clams. In my book there is no such thing as bad liver. Kidneys are a very different story. I’m with you on the liver thing. Nope nope nope won’t do it can’t make me! My dad was the only one in our family who would eat it, so he had to cook it or go without it. I tried to be anywhere but home on days he cooked liver. My father would fry chicken livers for breakfast. I’d bolt out of the house as fast as I could.